Galileo’s lone surviving in-tact telescope paid a visit to the Franklin institute this year. 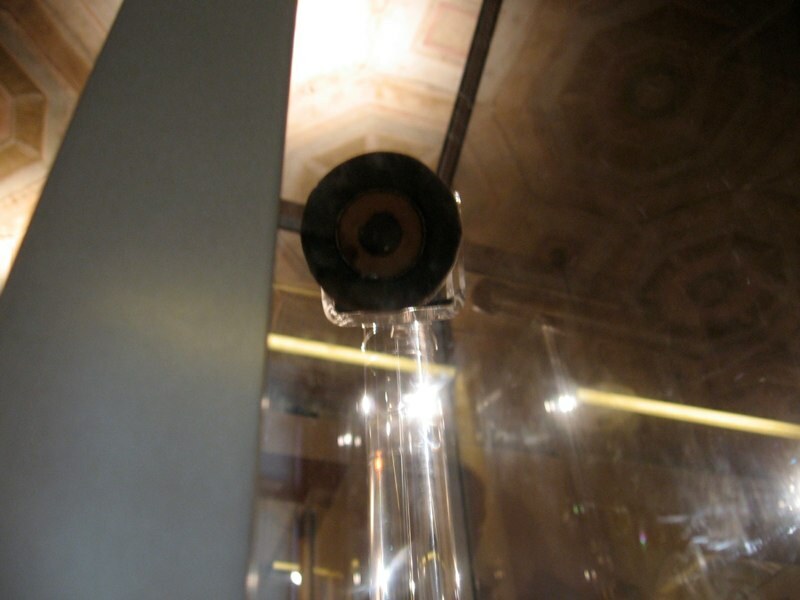 The telescope is there until September 7, when it will return to Italy.Until then it is part of an exhibit on Galileo and the age of the Medici, and there is another special exhibit related to telescopes and optics right outside the exit. Included in that exhibit was a display on how Galileo assembled his telescopes. The display case showing how the telescope was assembled has two cut-aways, one unfinished (the lower one) and one finished. There are 3 basic pieces to the telescope: the objective, the eyepiece and the tube. The tube is a series of wood strips glued to a black felt liner and formed into a tube. It doesn’t show up well on these images, but the outside of the unfinished tubes looked almost as if they had pinstripes. This was the felt showing between the tiny gaps in the strips of wood. Incidentally, they didn’t say what kind of wood Galileo used. The model was pale and very fine grained, and I suspect was made of something good for modeling, like poplar. When the tube was completed, it was covered with leather that was tooled and dyed. The leather would help add stability and structure to the tube, and give it a smoother more attractive outer appearance. Cut away showing construction of the eyepiece end of the telescope. The eyepiece and objective have similar construction. Again, a tube is constructed by gluing wood strips to black felt. You can actually see the “pinstripe” appearance of the eyepiece in this second image. The cell that holds the lenses is larger in diameter than the tube, and is mounted to a smaller diameter tube that will slip inside the main tube. This probably allows the lens to slide in and out, to obtain a good focus. The eyepiece lens is sanwiched between two aperature stops, which then fits into the front of the lens holder. The objective is a little different. It has it’s own cell, about an inch long and two different diameters (see the topmost image). The lens sits in the wider section between two aperature stops and held in place with a metal tension ring. The narrower end fits into the cell. You can see how this looks in the last picture. The objective end of the assembled models. Note the serperate lens carrier for the objective in the finished model. Galileo’s lone surviving in-tact telescope paid a visit to the Franklin institute this year. The telescope is there until September 7, when it will return to Italy. It is part of a larger (huge even) exhibit on Galileo and the age of the Medici. I have another blog post about the exhibit (with a little about the Franklin too). Coming up on the ‘scope, the most striking thing (to me) was just how long it was relative to its diameter. I mean, I’ve see pictures, and I know how a Galilean telescope is constructed, but jeez! It looks more like a medieval weapon than a telescope! If you look carefully, you can see that the tube is actually sagging. A Galilean style telescope is constructed so that the focal point of the objective is at the same position as the focal point of the eyepiece, so the tube length is equal to the sum of the two focal lengths. This way, you get an upright image. Also, it is easy to determine the length of the tube, and there is less travel for trying to focus it when you throw in that third lens (your eye). However, it generally has a tiny exit pupil and a dim image, so it’s a hard style of telescope to use. Astronomers and instrument makers of 400 years ago also had a problem caused by the low quality and strictly spherical shape of the lenses: chromatic aberration. Chromatic aberration is caused because the angle the light bends actually depends on the wavelength: blue light refracts a little less that red light, so the focal point for blue light is actually slightly closer to the lens than the focal point for red light. You can really see this looking through something like a crystal ball or round fishbowl. You can usually see straight through the middle, but as you look toward the edges you get a rainbow effect. Galileo was stuck with spherical lenses, so he had to find other ways around the problem. One way is to make the lens as flat as possible, so the light isn’t being bent as sharply. This means a really long focal length, and that is why the tube is so long. There was a sketch in one of the books in the exhibit that appeared to be a telescope of about 3 inches in diameter, but a good 15 feet long! An aperture mask also helps. The steeper the angle of incidence, the greater the angle of refraction. Light hitting the center of the lens should be coming in at nearly a 0º angle, but the angle increases as you get away from the center. An aperture mask like this one will block the light that would others wise hit the lens at too steep an angle. A tiny point of light in the lower right shows that, at the very lease, light does still get through. For anyone who is interested, the photos from my trip to Phily are at http://astro.lsa.umich.edu/~aquilla/pictures/Philadelphia09.html . And that’s what I’ve been doing rather than polishing blog posts. But I’ll add a few of those with some highlights soon. I’m in St Louis for the AAS/ASP/ Preparing for the Internaitonal Year of Astronomy meeting. The trip was as uneventful as everyone said it would be. I felt like the most disorganized person in the airport, but I made it with all my stuff in tact (and I didn’t have to check anything!) The flight was a little turbulent, which thrilled the little girl sitting behind me, but not exceptional. A little while before we started the descent, I noticed that there were a lot of small creeks and streams cutting across the landscape. They all had actual starting points, and all wandered pretty straight in one direction. Then the plain banked and I could see further in that direction. They were all running to the Mississippi, which is, in fact, huge. I can actually see it from my hotel window, and it took me a little while before I figured out what I was looking at. When I was a kid, I didn’t actually realize that the expressway and the streets around the hospital actually crossed a river, because it was too hard to see the river from the car. I don’t think I could make that mistake here.